If you’re anything like me, pasta is one of your favorite ingredients to use with as many dishes as possible. Pasta makes such a satisfying dish and never leaves you feeling hungry. This Mascarpone Mushroom Pasta is definitely at the top of my list when it comes to choosing my favorite pasta dishes. Plus, I don’t have to do near as much because it’s made in the air fryer instead which saves me quite a few steps. Mascarpone is a pretty common ingredient however, you may still be unfamiliar with what it is. Mascarpone is a type of cheese that’s used much in the way that ricotta is. It’s made with whole cream tartaric acid to thicken it. It’s delicious and creamy and pairs well with pasta dishes which is why it’s perfect in this Mascarpone Mushroom Pasta recipe. What Can I substitute for Mascarpone Cheese? Although it won’t taste exactly the same, you can also try to use Ricotta cheese as a substitute for Mascarpone cheese in this recipe. 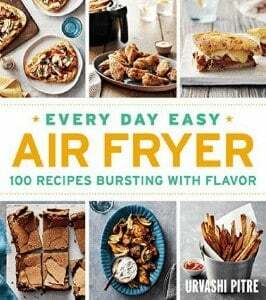 Many of my air fryer recipes are made by just putting everything in the air fryer. However, with this dish, that’s not the case. Yes, you do have to make the pasta separately, but the sauce is so hands off that it practically cooks itself, so you still bought yourself some extra time! Despite having one little extra step to add on outside the use of the air fryer, this is still one of my quicker dinner dishes. 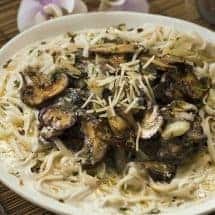 The combination of earthy mushrooms with the creamy pasta just makes for a wonderful blend of flavors in this Mascarpone Mushroom Pasta. One thing that I love about pasta is that it’s easy to get a version that’s egg-free and allergy-friendly altogether. This makes it a healthier option as well as vegetarian-friendly. Not to mention, it’s a dish that won’t leave you feeling hungry even though there’s no meat. Use Carbanana noodles. They are more low carb than keto, but there’s closer to real noodles than anything else I’ve tasted. Use soybean noodles, if you eat soy. Serve with this cauliflower “mac” and cheese recipe. 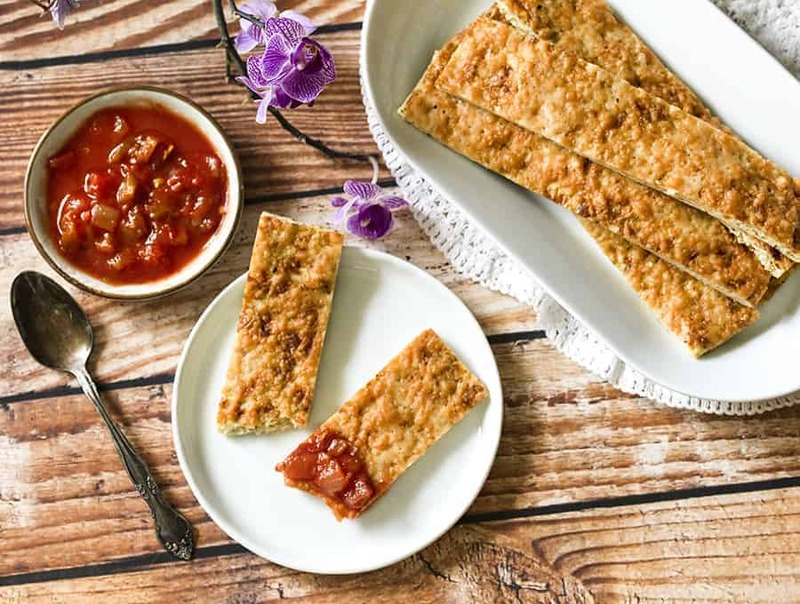 These Cauliflower Breadsticks make a great addition to this pasta dish! They’re low carb and oh so delicious. 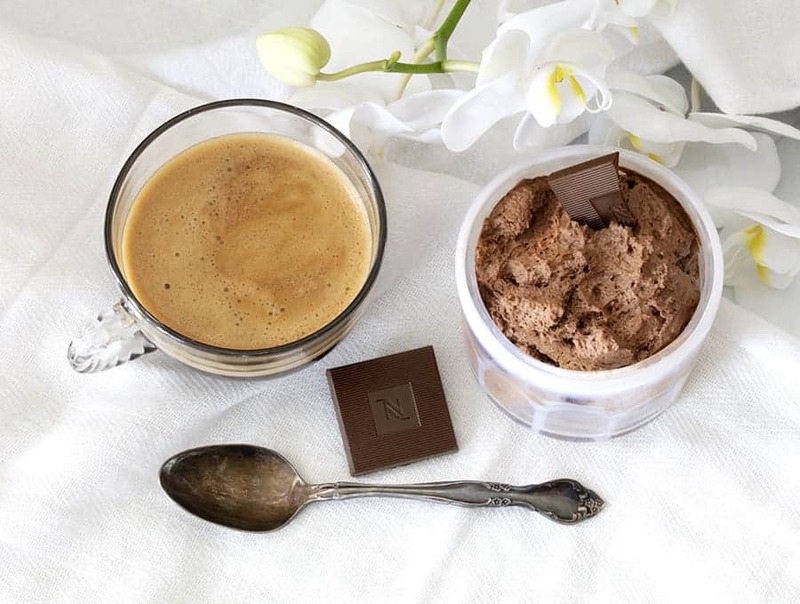 Looking for a dessert to wrap up your meal with? Check out my Keto French Silk Pudding. This simple 5 ingredient dessert is simply delicious and low carb as well! I truly love dishes that blend perfectly together like the ingredients were made to be mixed. Mascarpone Mushroom Pasta is one of those dishes where the flavors and textures flow so well that you just can’t stop eating. 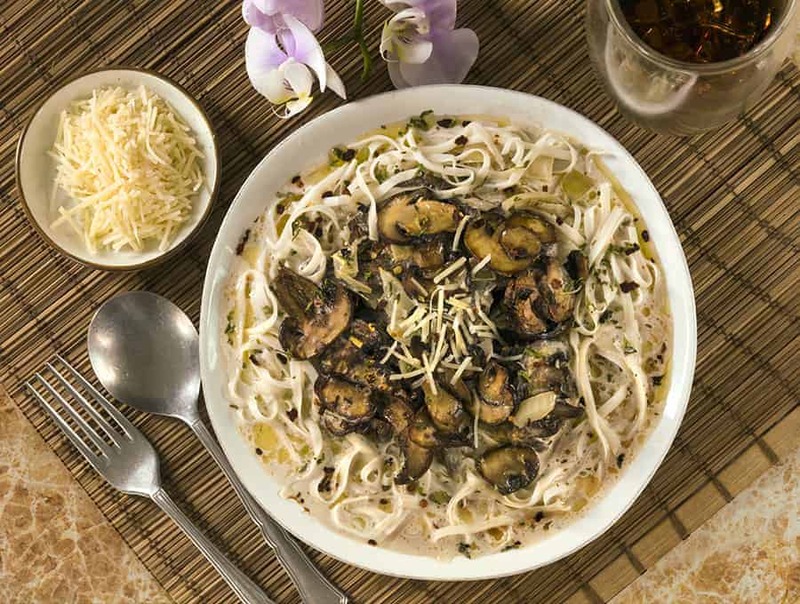 The soft noodles mixed with the creamy mascarpone and mushrooms are the perfect match for a delightful and healthier dinner. This is a guaranteed hit for any family dinner. This Mascarpone Mushroom Pasta is an absolute delight to eat! 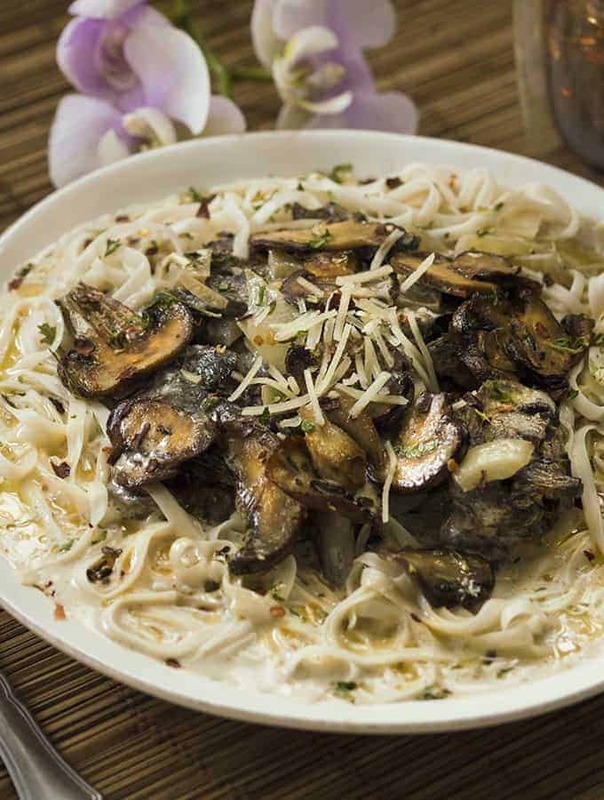 Air fry the creamy mushroom sauce while boiling the pasta & have the dish in under 30 minutes! Grease a 7 x 3 inch pan and set aside. In a medium bowl, combine mushrooms onion, garlic, cream, cheese, thyme, salt, pepper, and red pepper flakes. Pour into greased pan. Set air fryer to 350°F for 15 minutes. Halfway through, open and stir the mixture well. Meanwhile, boil 4 cups of pasta until al dente. Divide across four bowls. Remove the mushrooms and mascarpone mixture and divide evenly on the pasta. Sprinkle the Parmesan cheese on top and serve. Previous Post: « 15 Best Vegetarian Instant Pot Recipes You Need to Try NOW!